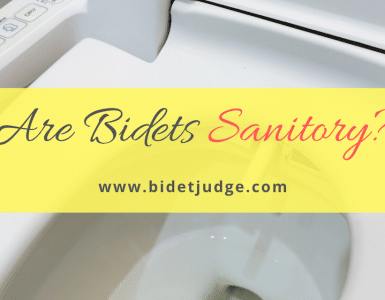 Types of Bidets: Which one is the Best for You? When it comes to being super hygienic, toilet paper simply fails. It fails to clean you properly and simply ends up irritating you. This is true, especially, for folks suffering from conditions such as hemorrhoids, irritation or any other diseases. Perhaps this is why most countries in Europe and Asia have resorted to using bidets. Why should you use a Bidet? A bidet is a sort of plumbing fixture that allows you to wash after using the toilet with water. They have been used all over the world since quite some time. However, in Northern America, bits are still in their infancy. 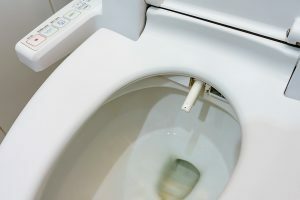 A common confusion that American folks or other non-users have is that they consider a bidet to be some sort of toilet. It is not a type of toilet, even though it may look like one. It is a separate unit which you can use to clean yourself whenever you are finished with the toilet. They are also known as washlets or Japanese toilets. There are several advantages when it comes to using a bidet. Toilet paper is made from trees and hence using a bidet can help reduce the consumption of toilet paper and hence trees. Let’s face it! If any other part of your body got dirty with solid waste, would you just scrub it with an abrasive paper or would you wash it? More environmentally friendly as less TP is used. Helps you save on the cost of Toilet paper. Using less toilet paper means lesser clogging problems. Results in less household waste. Ceramic bidets are also known as standalone bidets. The standalone bidet is an entirely separate unit inside the bathroom, different from the toilet. These are the more conventional devices as they have been used for centuries. It is only used for cleaning yourself after you’re done with using a bidet. By any means, it can’t be used to get rid of waste. These types are more common in Europe and a few countries and South America. Using them can be a little complicated. The taps at the end of the bidet can be used to adjust the flow of water. Most bidets have two nozzles, one for feminine wash and one for posterior wash. Although they are more conventional, they do tend to have modern features like hot water and options to adjust the temperature. Due to their decreasing popularity, prices have gone lower. However, the standalone bidets do have their disadvantages. They can often take up much more space, which is why they are not suited for modern bathrooms. They require separate plumbing fixtures to provide you with water. Plus, they require you to move from the toilet to the separate, which can get messy. They often lack many modern features as found in toilet seat bidets. However, if you do have a larger bathroom, they will add a certain class and sophistication to the look of your bathroom. Floor mounted bidets are available in a number of different styles as they are much older. They are mounted to the floor and attached to the plumbing through there. They can often get in the way and are much harder to clean than their wall mounted counterparts. There is not much difference between the wall mounted and the floor mounted bidets in terms of functionality. Wall mounted bidets are much more modern and tend to have a sleek contemporary look about them. These tend to bring a much more modern yet sophisticated look about them. They help in saving a lot of floor space. Cleaning around them can be a breeze! Toto Aquia CT418FG#01 is a wall mounted standalone bidet which saves up to 9 inches of floor space. 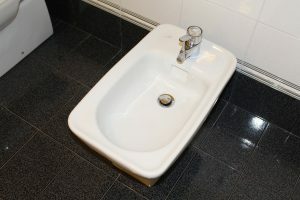 Over the rim, bidets can be considered a sort of standalone bidet. These are actually a little different than a standalone bidet in terms of functionality. The standalone bidet makes use of a water jet to help you clean all necessary areas. However, over the rim bidets simply fill themselves with water till the rim. They have a faucet that allows you to do so. In this case， you sit inside the water and use your hands to clean yourself. However, most folks can find them to be a little less hygienic and prefer the spray of the conventional bidet. Toilet Seat Bidets are a newer version of the bidet and can even be seen in North America. These are actually inspired by the Japanese and can fit over any toilet. These toilet seats come with a bidet incorporated into them at the bottom. The bidet can be controlled easily, either by a remote control, a panel by the side or a mechanical lever. The best part about toilet seat bidets is that they are available with a number of different features. Hence, their prices range wildly according to these features. For example, the Toto S550e Washlet is relatively expensive while the GenieBidet Seat is very cheap. The major difference between them is the number of features it provides to the user. Electric bidets are much more expensive than their non-electric counterparts. These are equipped with countless features which help with comfort and hygiene. These bidets use electricity to operate. They are more complicated to install. One of the best features includes controlling the temperature. These electric bidets allow you to use warm water for added comfort! What’s more is that you can even heat the toilet seat. Such features are highly sought for in colder countries where using the toilet is akin to freezing yourself. They even allow you to adjust the spray pressure to one which suits. Of course, some folks prefer higher pressures for cleaning, while others suffering from hemorrhoids would prefer a gentle cleansing. These even have extra features such as air deodorizer, air dryer, and self-cleansing wands. All these features are controlled by a remote control or a remote panel by the side. The more the features, the higher the prices tend to be. Non-electric bidets are directly connected to the plumbing. These use pressurized water to help spray jet streams. A mechanical lever or a knob is present on the side of the seat to allow you to adjust the pressure of the stream. In addition, they are very affordable. However, these do not come with hot water and mostly only their pressure is adjustable. Some models do support warm water, however, this is only for those who already have a warm water tap. Other features may include a self-cleaning wand and dual nozzles. These features are basic ones but they still are very necessary. Self-cleaning features allow you to clean the wand from any waste while the dual nozzles allow you two different types of washes. All in all, these bidets tend to be much more affordable, compact, eco-friendly! A hand-held bidet is also known as Shattaf due to the Middle Eastern origin of the sprayer. It is basically a hose connected to the plumbing with a sprayer at the other end. This is quite popular in Muslim communities. These are quite easy to use and are affordable as well. Moreover, you can install them yourself. They allow you to have better control over the pressure of the spray. However, they do tend to be much more difficult to position as you have to do it with your hands. They do not have any luxury features either! They can, however, tap into your home’s supply of warm water for a more comfortable experience. Portable Bidets are a savior to those who use bidets. The portable bidet is actually a simple water bottle with an extended and angled nozzle at the top such as in the Brondell GS-70. 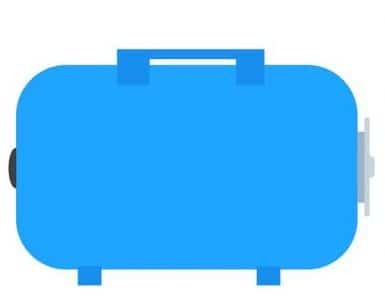 These are very helpful for users who are traveling. Most folks with hemorrhoids can’t use a public bathroom or other people’s bathroom as they cannot use toilet paper. However, with a portable bidet, they can easily go anywhere and not worry about irritating their skins. These are also known as travel bidets or bidet bottles. Portable bidets are also available in an electronic version. These are powered by batteries and deliver a much better spray than the bottle one. These are the best option to go for when you don’t have a regular bidet available. Although we wouldn’t recommend them for regular use, most people do use them at home. However, they find that the pressure is lacking and that water ends up quickly. The main disadvantage many folks face is that you need to fill the water from a faucet. In cases when there is no faucet available, you might be stuck. This is because they cannot be used by pre-filling them. Furthermore, they tend to be harder to use for those with disabilities. 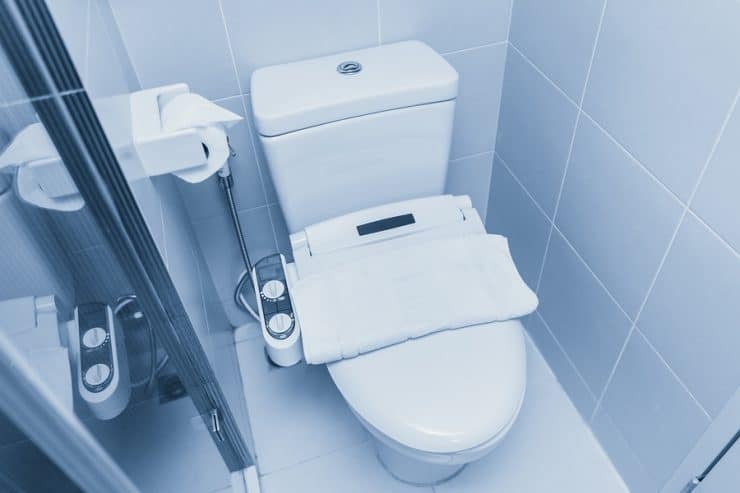 One common fault you might find with toilet seat bidets is that these seats have a specific size. This means that they only fit certain toilets. With bidet attachments, you need not worry if it will fit your toilet. Whatever the size, they will fit quite snugly on your toilet bowl under your existing toilet seat. They are usually very affordable. However, they lack in a lot of features that are usually present in a toilet seat bidet. For example, you cannot control the water temperature and there is no air dryer or deodorizer. This may be because they are not electrically powered. However, some models such Neo 320 from Luxe Bidet tend to allow you to tap into your home’s warm water supply. Who would want to go through the hassle of picking out a toilet and then a separate bidet? Well, the newest innovation in the world of bidets is the toilet bidet combo. These have a toilet seat with an attached spray to help you cleanse yourself. However, these bidets are built into the toilet. A great example is the Toto 700 H. They are much more functional and provide a better style. Since the unit is a seamless one, you won’t face problems such as the seat coming loose due to the high pressure of the bidet or the toilet seat and the toilet color not matching. However, these units are much more expensive. They come with a wide variety of functions and features. Bidets are available in a number of different types. It all depends on the kind of features you want and your budget. If you’re willing to sacrifice features for an antique look, then the standalone will suit you better. However, for more affordable options, you can try the handheld sprayer or perhaps the non-electric seat. For those who do not want to be sprayed with cold water, electric toilet seat bidets and the toilet bidet combos can be the only option. On the other hand, if you’re looking for a more hygienic way of going to the bathroom while traveling then the portable bidet can be your savior! All in all, whichever type you choose, it is bound to leave you with a fresh, clean and comfortable feel!